Pune Football Club [ Pune FC ] is getting a chance to rewrite Indian Football history when they play Blackburn Rovers in an exhibition match. This will be the first time that an English Premier League [ EPL ] club play against an I-League club. This historic match will take place on Friday, July 22 at 7.00 pm, at the Shiv Chhatrapati sports complex, which is the home ground of Pune FC. Rovers enjoy a 135 years of history in English League. Rovers is one of the oldest and the most reputed clubs, not only in United Kingdom, but also in other parts of the world. In 1995, they were the league champions when legends Alan Shearer and Chris Sutton formed the squad. Currently owned by Indian poultry giants Venky's, who is Hqed at Pune, it is one of the highly reputed clubs in England. One of the most shocking decisions in English Premium League was that the Indian poultry giants, Venky's bought the Lankashire club for 23 million pounds ($36.50 million). The Lancashire based Club's Indian tour will be the first ever trip of the club of English Premium League to the subcontinent. This premium Club is currently one of only four clubs to have won the Premier League, along with Arsenal, Chelsea and Manchester United. Rovers' sojourn to Pune also marks their first visit to the base of their owners - Indian poultry giant Venky's. 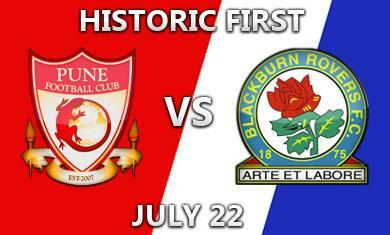 The first choice to play against Blackburn was not Pune FC . East Bengal was approached previously but as they opted out on plea that most of their players were unavailable due to international duties and holidays, Pune FC was roped in. Rovers' with midst regulars Chris Samba, Paul Robinson, David Dunn, Brett Emerton, David Hoilett, Jason Roberts, Morten Gamst Pedersen, Michel Salgado, Martin Olsson, Steven Nzonzi and Ryan Nelsen will provide a good match before the Indian fans who will have a taste of a mix of home and international stars. The India fans who are crazy about English Premium League Football will have a lot of excitement and a rare chance to see their favourite stars on ground. Blackburn is managed by Steve Keane and last season they finished 15th in the EPL. The Blackburn Rovers will not only play Pune FC but also start some grassroots work in India to promote the sport. .After the match in India, the English side will proceed to Hong Kong to participates in the EPL's Asian Trophy in Hong Kong on 27th and 30th July 2011, along with Aston Villa and Chelsea. It is a ground reality that Pune is all set to witness Indian football history when their very own professional side Pune Football Club entertains English Premier League team Blackburn Rovers FC in a much awaited exhibition encounter. This is the first of its kind. Pune FC is a newly founded club founded in 2007. Since the launch of Pune FC, they adopted a systematic approach to achieve their goal, and within this short span they have become a model club. So this will be a clash of traditional football versus the modern approach. Derrick Pereira coached Pune FC is promoted by Ashok Piramal Group of Pune and sponsored by Peninsula Land Ltd. also of Pune. This is a very rare and a great opportunity for Pune FC to rub shoulders with quality footballers apart from the fact that the football fans get a huge occasion. They won't be missing the chance to see their favourite stars take the field. Pune FC, on their part, is likely to field a host of their new signings/faces made for the upcoming 2011-2012 season and are confident to brace up to the challenge. In 2009, Pune FC was qualified for the I-League and they have so far achieved Top-5 finishes - a third place in their maiden year of the elite league and fifth place last season. The capacity of the stadium is expected to be in the region of 20000 and it is announced that all tickets for the friendly tie will be complimentary. The management committee have sent invitations to 46 Schools. They have also invited fans of Blackburn and Pune FC apart from the employees of Venky's and other corporate besides some celebrities in the State. They have planned the distribution of the tickets ensuring that the tickets issued are not wasted. The Venky's marketing team is making efforts to draw sizeable crowd. The Pune Dist Football Association (PDFA) is entrusted the responsibility to manage security arrangements. This is an important issue following the recent blasts in Mumbai, which at one stage left Blackburn's visit in jeopardy..With the stadium having hosted a number of high-profile matches in the recent past, including an AFC Cup Tie between Dempo and Lebanese club Al Ansar and an Olympic qualifier between the under-23 sides of India and Qatar, the pitch is already in good shape for Blackburn's visit. The All India Football Federation has shown its green signal to go-ahead and the Western India Football Association has confirmed having received NOC from the central and state government departments. The game is a going to be a landmark encounter for Indian football fans. Punites and Pune FC should be thrilled to be part of this treat. Pune FC is equally excited and honored to be the first team from India to play this game that revolves around inscribing history of Indian Football. A late evening 7.00 pm kick off is planned on 22nd July 2011 at Pune ! The Football community in Pune and elsewhere are totally disappointed for the time being as the proposed visit of the Blackburn Rovers to the subcontinent is postponed. The decision is taken by Blackburn club due to the recent Bombay blasts. However, their manager, Steve Kean has confirmed that the trip is not cancelled and that the proposed tour to the sub continent would be made sometime in the beginning of October this year. Though we are dejected for postponement of the first ever visit of an EPL Club, considering the current climatic conditions, may be this may be turned out to be a blessing in disguise.